Most decorating blogs that I read tape about 50,000 color samples to the wall to decide which color is best for their room. I go to Lowe’s and pick out the prettiest sample. I walk away for a few minutes and then come back and pick out another pretty one. It’s usually the same color. I take that color sample to the paint counter, buy a gallon, and head home to paint. It’s a science. Say good-bye to Macademia and hello to Gravity….. I tape everything….because I am the world’s messiest painter. I surprisingly didn’t make a mess. Go me! AND….I painted the entire room all by my lonesome. This was huge for me. Luckily, Nate and I were on to this whole “decorating world going grey” thing in a lot of rooms in our house. I don’t know WHAT we were thinking when we painted this guest bedroom beige when the rest of the basement is grey. I think we were thinking that we just want to be done painting and we have some of this macademia color left. It was later in the day when I took this picture but the bedroom grey now matches nicely with the darker hall grey. And then I looked at the guest bathroom next door…..
Who wants to help me paint??? How do you pick out your paint colors? Are you a sample taper or do you just wing it? Nate had this dresser that he received as a hand-me-down. It's a nice dresser. It just doesn't fit our decorating style. I had pondered painting it for about 2 years but was too afraid to ruin it. Once we moved, I decided it needed a make-over. 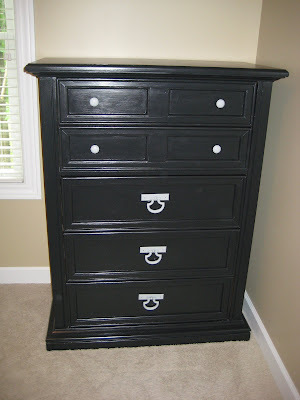 This was my first attempt at furniture painting...my gate-way furniture piece, if you will. I was happy with how it turned out. I just wasn't sure what to do with the hardware so I decided to spray paint it. It stayed like this for about a year. We didn't really like it but we were too lazy and cheap to figure out something different (it happens). When the nighstands entered the picture, we decided to get matching hardware. And here is the dresser today. Much simpler. More to come with completing the guest room!